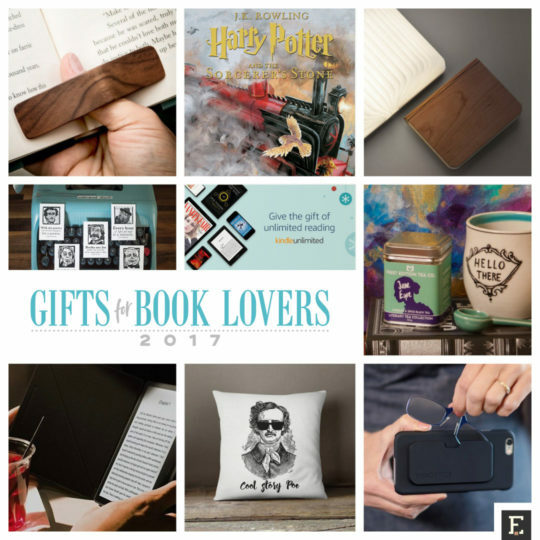 Looking for fresh new gift ideas for the book lover in your life? Here are the best items we spotted in 2017. Deciding what gift to give to someone who loves reading books is not easy. Getting another book may look like you’ve run out of ideas. On the other hand, maybe there is a newly released book that the book-loving member of your family is impatiently waiting to get. The key to succeeding is gift discovery. You don’t need to limit yourself to books, jewelry, or posters. All you need to do is to spend some time and search for book-related gift guides prepared for this holiday season. The more lists you explore, the better idea you will have what new products are available – and how exciting they are. Below, you will find our recommendations. 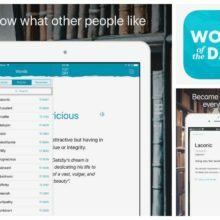 Explore new literary findings from Amazon and Etsy online stores, as well as less known – but unique products – created out of love for books and reading. The literary kitchen magnet that keeps important daily reminders always in view is a refreshingly new idea for a bookish gift. Especially, when the magnet is as stunningly designed as the ones from East Grove Studio. Each one features a quote from a famous author and a beautifully crafted portrait. You can buy the magnets separately, but there is also a set of five, which I strongly recommend. ⇢ Amazon – $20. 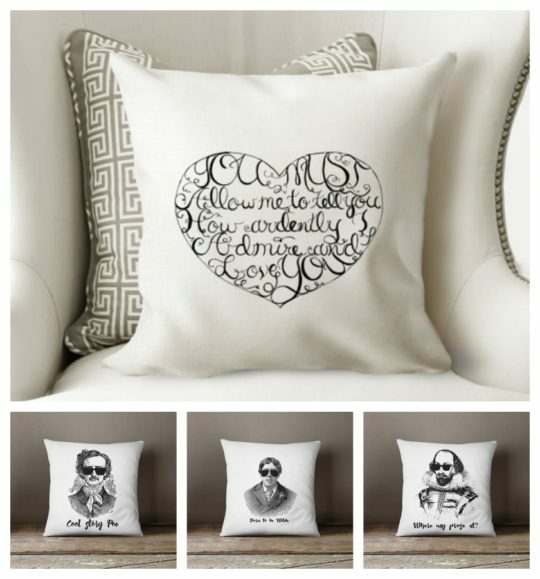 If not, take a look at the collection of literary pillows created by Ponder & Dream and offered on Etsy. The passage from novels by Jane Austen or Henry David Thoreau, a portrait of the famous writer, or a motivational book quote? It’s you to decide which of these great ideas you want to gift your beloved ones. And what about getting two or three such pillows, to make literature rule in home? ⇢ Etsy – $35. Ken Follett has released in September a long-expected third part of the bestselling Kingsbridge series taking place in the medieval England, in the fictional town of Kingsbridge. The new book, entitled A Column of Fire, takes bestseller lists by storm, and it will surely be one of the most gifted novels this holiday season. Even a better idea would be to buy all three books from the series, including previously released The Pillars of the Earth and World Without End. ⇢ Amazon – $15.99 (Kindle Edition). If you want a reading light to be a part of the literary interior, this is one of the most clever ideas. And when you don’t use it, you can put it back on a bookshelf. The lamp is powered by a lithium battery and gives light for up to 6 hours. You can recharge it via USB cable. The lamp is portable. 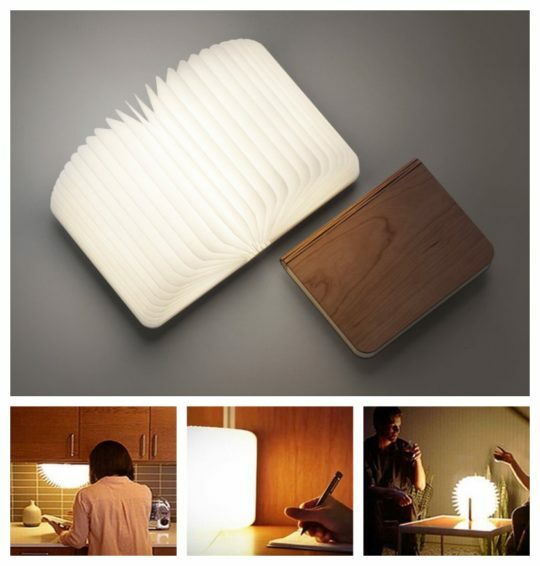 Weighing 350 grams and having the size of the hardcover, it can be used as a camping lamp. The most awesome feature is the light color change. You can switch the tonality of light by simply opening and closing the lamp. You can choose from Warm White, Blue, Red, and a few options of Green. ⇢ Amazon – $39.90. If your beloved one needs glasses only for reading and is using the latest iPhone, think about combining two devices in one. Reading glasses offered by ThinOptics are compact, durable, and feature ultra-flexible titanium alloy bridge which is ten times more elastic than spring steel. 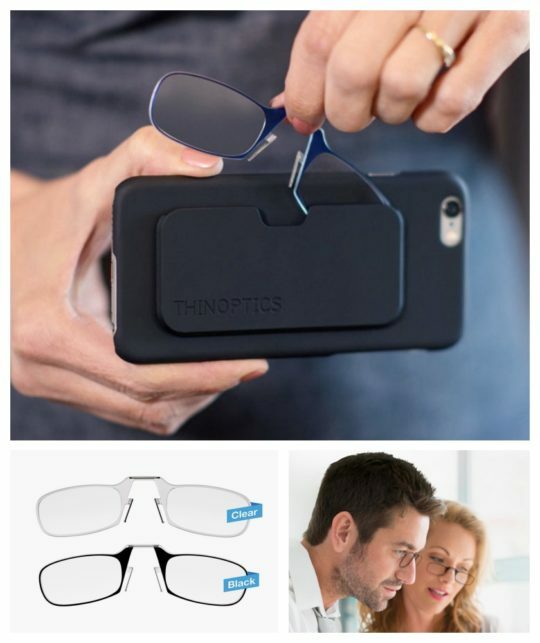 What’s even more important, the glasses are so thin that you can place them on the back of a special iPhone 7 case. And the case is included, as well! ⇢ Amazon – $29.99. 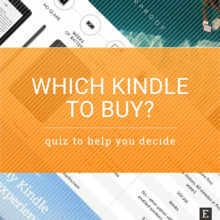 Is the booklover you want to gift a Kindle fan? The newest device from Amazon – the 2nd-generation Kindle Oasis – is the world’s most advanced e-reader. It’s worth its money if you want to satisfy the most important book lover in your life. 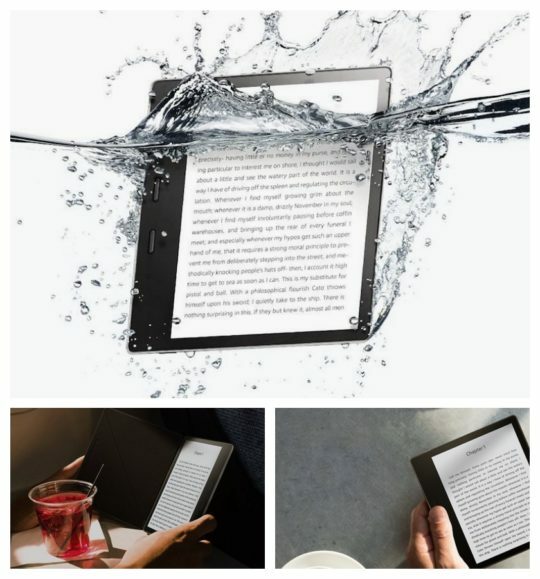 Kindle Oasis 2 is waterproof, so it can be taken to a bathtub without worrying something happens when water spills on its display. Most importantly, it’s the first Kindle in years which is capable of playing audiobooks. And the asymmetric design enables the user to hold the Oasis in one hand for long hours comfortably. The newest Oasis comes in two storage options and sports the 7-inch, 1680 × 1264 px display – better and bigger than in any other Kindle. ⇢ Amazon – $249.99. 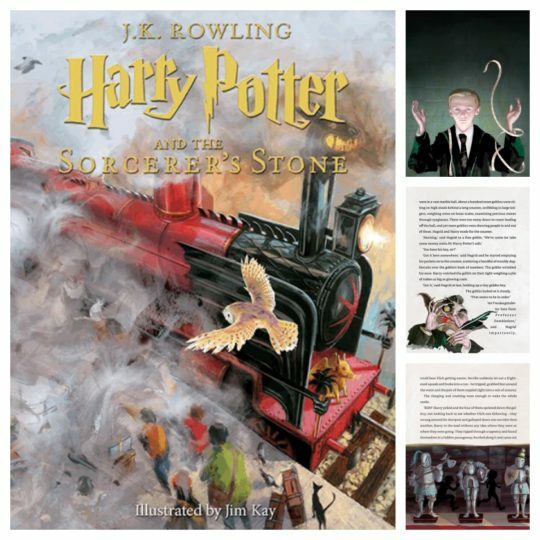 This edition of Harry Potter and the Sorcerer’s Stone beautifully illustrated by Jim Kay is a must-have book for everyone whose teen years were full of magic thanks to Hogwarts School of Witchcraft and Wizardry. The hardcover edition is available since late 2015, but I’d like to draw your attention to an exciting new format that helps the Harry Potter magic literally live on the pages. The new format is called Kindle in Motion. It adds gif-like loop animations and video embeds to the books. Just imagine Jim Kay’s illustrations being subtly animated, and you’ll fall in love with the new edition without even seeing it! Harry Potter and the Sorcerer’s Stone in Kindle in Motion format can be enjoyed on free Kindle apps. It can make a perfect last-minute book gift. ⇢ Amazon – $9.99. 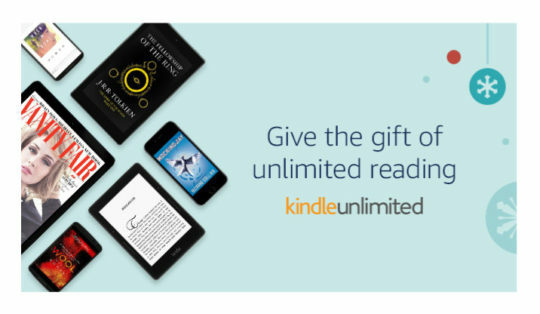 If your significant other or a family member reads a lot of Kindle ebooks, think about gifting Kindle Unlimited ebook subscription. 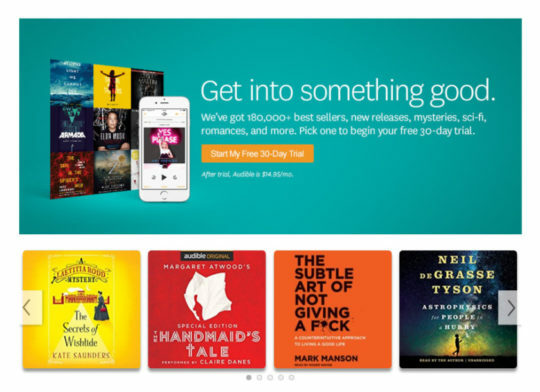 The Kindle Unlimited subscriber has free and unlimited access to over 1.8 million titles. Among them, you will find not only Kindle ebooks but also newspapers, magazines, and audiobooks from Audible. As much as 82 of the bestselling Kindle books of 2017 are included in Kindle Unlimited – it sounds like a solid recommendation! You can buy one of the three subscription plans: 6, 12, and 24 months. We recommend getting the one-year plan, so the option to prolong the membership will be open the next holiday season. 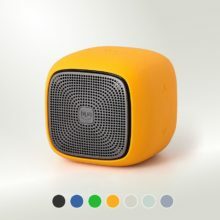 ⇢ Amazon – $119.98. Audiobooks are on the rise. They are growing quicker than ebooks. 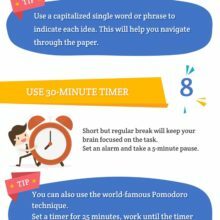 And they give a chance to follow the plot of your favorite book while doing other things, such as driving a car or cooking a dinner. One way to gift Audible audiobooks is buying single titles. But what happens if you choose the wrong title? A better, more flexible option is to gift an Audible membership. A Gold plan gives access to a catalog of 180,000 books. The member can get one book per month for free, and have a 30% discount on additional books. ⇢ Amazon – $14.95/month. 10. Literary teas from First Edition Tea Co.
A book, a comfortable chair, a scent of an old library. The book lover in your life has everything to be happy. Wait, something is missing! Something to drink. What about the tea? 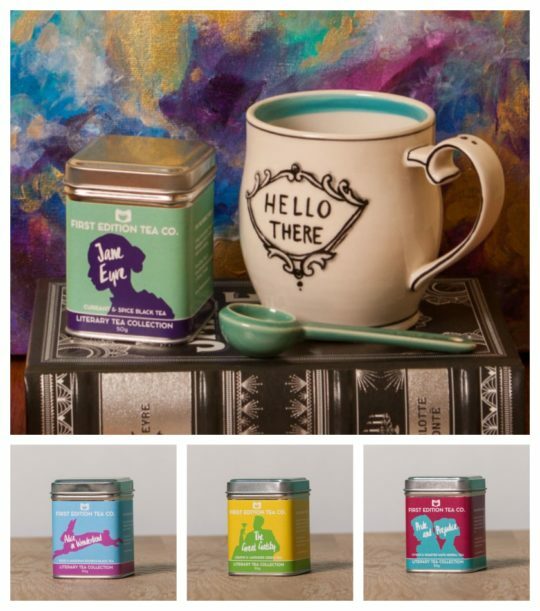 Take a look at unique tea blends from First Edition Tea Co. that are inspired by literature. How would you imagine the taste inspired by Sherlock Holmes? Shouldn’t it be based on traditional English Breakfast tea, with pipe smoke, and a hint of bergamot? The Great Gatsby is all about lemon and organic lavender. Alice in Wonderland offers a combination of rooibos, papaya, almond, and rose petals. Reading a good book with a cup of a favorite tea can now reach a whole new level. ⇢ Etsy – $12. 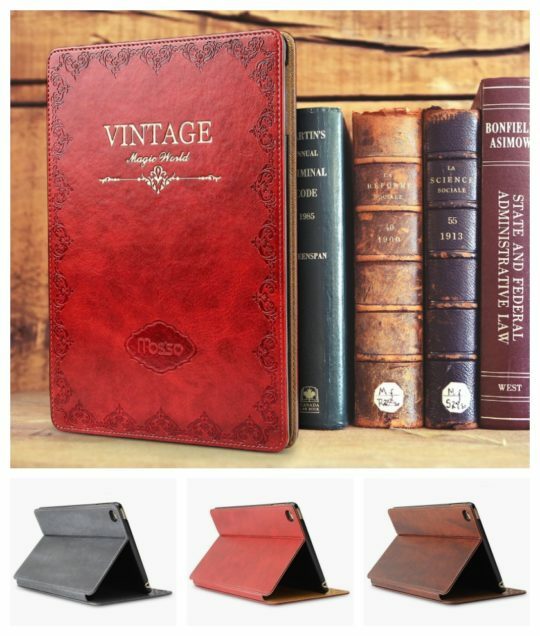 A great gift for anyone who loves the newest technology but is missing the look and feel of an old book. 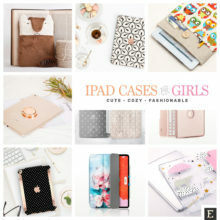 A series of iPad case covers from Jgoo makes the life of book lovers much more enjoyable. Every time they will open the case they would feel like opening a book. At the same time, the case is extremely thin (so it add almost no bulk to the tablet), and supports auto sleep/wake feature. It’s available in four colors: Blue, Brown, Gray, and Red. Among the models it fits, there are the 2017 9.7-inch iPad, iPad Pro 10.5, and the 4th-generation iPad Mini. ⇢ Amazon – $18.99. Is your family member frequently visiting a library or attending a book club meeting? A relevant tote bag will be a blessing. 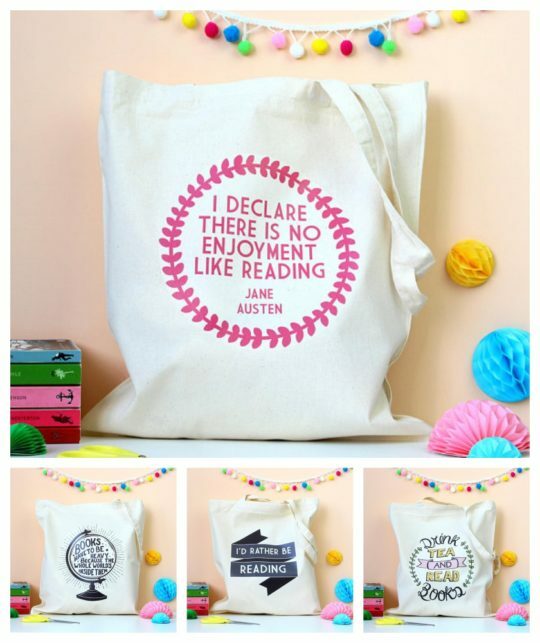 Out of many different designs from several artists, I’ve picked for your consideration a collection of literary tote bags offered by Fable & Black. You may say they are too fancy or too bright, but on the other side: isn’t reading a kind of activity that brings inspiration and freshness to life? You can choose from almost 30 designs. Some are using bright colors, such as the one with Jane Austen quote, the others are minimalist black & white projects. ⇢ Etsy – $11.99. 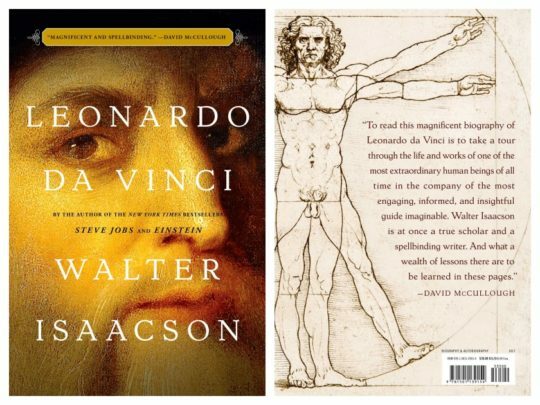 The new biography by the author of Steve Jobs and Einstein tells the life of Leonardo da Vinci in an exciting and inspiring way. The book is available in hardcover, as well as Kindle format. You can also get it as an audiobook. ⇢ Amazon – $14.99 (Hardcover). 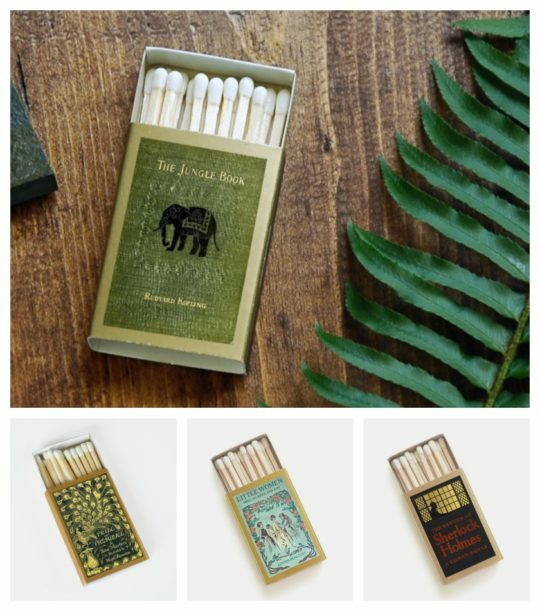 Literary matchboxes from Studio Portmanteau are a great little addition to any bookish gift, no matter whether it’s a book itself or a book-related accessory. Each matchbox features a beautifully retouched cover from an original edition of the literary classic. The collection includes over 50 such books. Pride and Prejudice, A Christmas Carol, The Return of Sherlock Holmes, and Call of the Wild are among them. 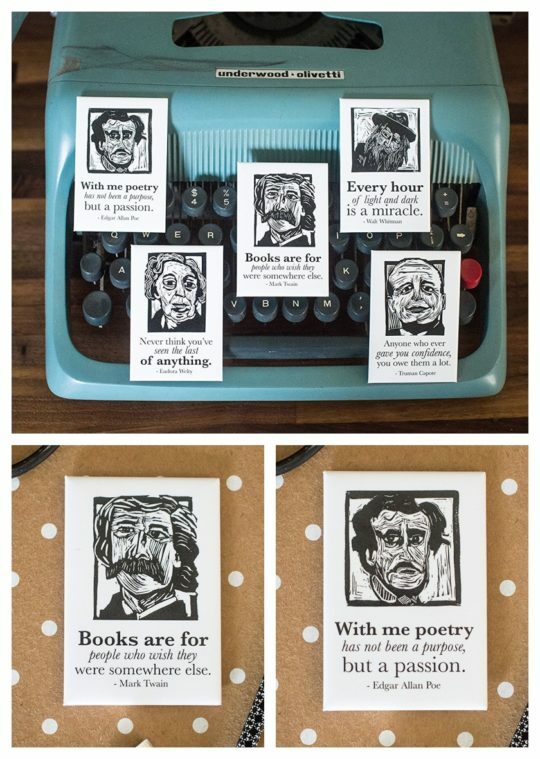 These literary matchboxes are great for dinners, picnics, or book club meetings. I personally find them a perfect collectible series. ⇢ Etsy – $3 each. Reading real books made easy – this simple and stylish page holder helps keep the pages in a book wide open with one hand. The wood is more suitable for page holders than any other material. The warm, smooth texture of American Walnut compliments the feel of any book. No matter whether someone is standing, sitting or lying down, one hand is free to hold that wine glass. 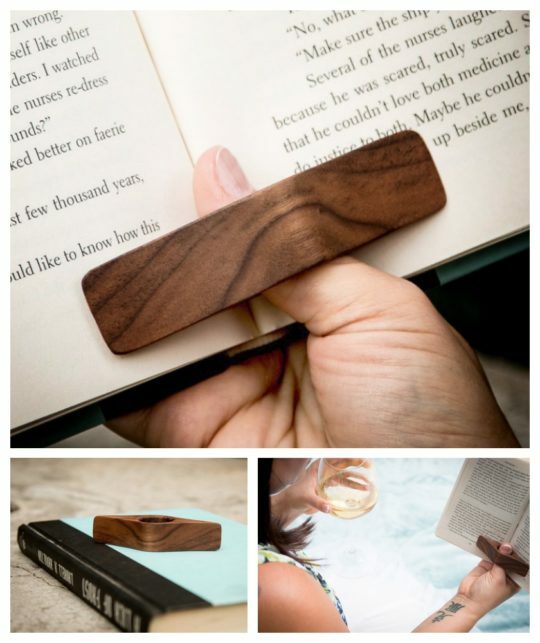 This book holder comes in two sizes: regular and large. ⇢ Amazon – $20.99. 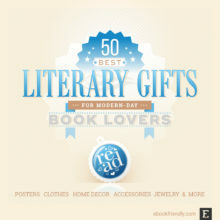 Where to buy gifts for book lovers? Have you found this gift guide useful and picked a perfect holiday gift? If not, make sure to explore these great sites for more gift recommendations. 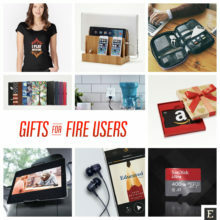 Amazon Handmade – many users find gifts on Amazon. When you search the entire store, you may easily get disappointed with too many items that look cheap. However, in Amazon’s sub store called Handmade, you can find goods that are beautifully hand-crafted to order and can be personalized. Not on the High Street – the site is a default online destination for gift-seeking users from the UK. If you want to find inspiration for homemade gift ideas, this is the site you should check out. Zazzle – it’s one of the largest online destinations for gifts and accessories of all kinds. You can pick up an artwork and choose the item you want it on. If you prefer to use your own photo or design – you can do it! A customized literary gift? Try Zazzle. 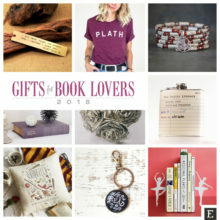 Etsy – visit Etsy and you’ll immediately realize it’s loaded with gorgeous gifts any book lover would be grateful to receive. As all items are made to order, there are several ways to add a personal message – also for the bookish items listed above.